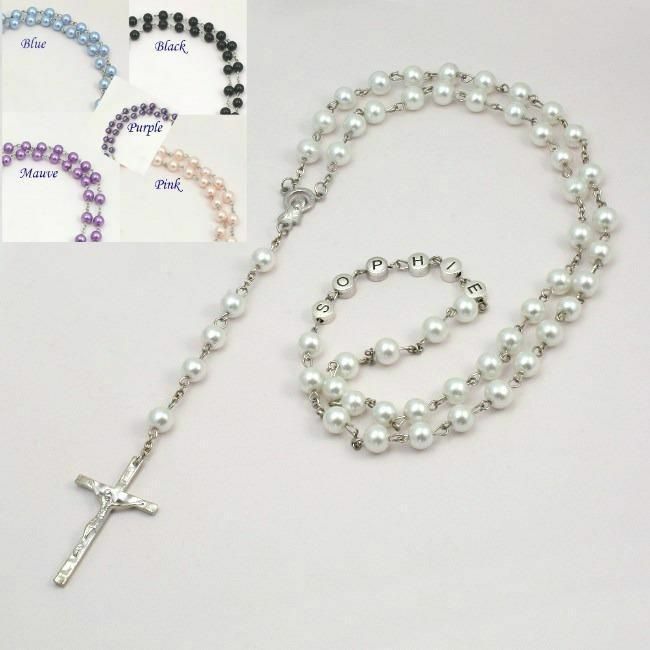 Pearl Rosary Beads with Any Name (up to 10 letters) in Pewter Letters. This lovely rosary is made with beautiful 8mm glass pearls. Size: Long enough to fit over the head on adult or child. Each pearl measures 8mm. The rosary (as laid out in the photo) measures 57cms from the tip of the cross to the top of the beads. From the top of the centre piece to the top of the beads is 41cms. Therefore the total length of the five decades (i.e. the main beaded section of the rosary) is 82cms measured all the way around.